Thornton Iron & Metal, Inc.
ATTN: SEE NEW LAWS PAGE!! 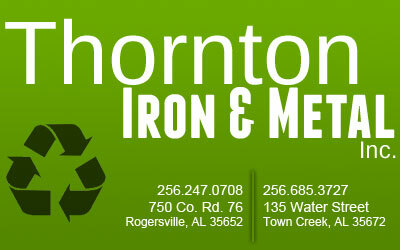 Thornton Iron & Metal, Inc. was founded in 1974 by James Thornton. In 1990, James' son Mike Thornton purchased the business. What began as a small family business with only 3 employees and 1 location, has grown into a 45+ employees and 2 convenient locations in North Alabama, in the cities of Rogersville and Town Creek. Our mission is to provide a professional and affordable recycling collection service for businesses and institutions, as well as our drive up customers, in the North Alabama area, with an emphasis on customer satisfaction. In order to do so, Thornton Iron & Metal, Inc. acts as it's clients' recycling coordinator to help them optimize their recycling system and maximize the potential benefits of our service (e.g. cost savings, conservation of natural resources, and contributing to the development of a sustainable community). In addition, Thornton Iron & Metal Inc. strives to provide a work environment that is safe, fun and provides opportunities for its employees to grow on a personal and a work level. We have continued to grow and prosper thanks to our amazing customer base. We offer A+ customer service and are here to serve you and offer the most competitive pricing available. We look forward to doing business with you. We are open to the public as well as commercial companies. Now is a great time to clean out your workshop, barn or garage, and earn some extra cash while cleaning up the environment. If you have piles of junk metal lying around, now is a great time to contact Thornton Iron & Metal, Inc.
Be a part of the environmental solution! Recycle reusable scrap metal and turn your junk into cash!